I snapped this picture from my desk, straight out of my office window. I don't think this view will ever get old! And I can't help but feel abundantly blessed everywhere I look in our new home. What a magnificent, peaceful view you have! It looks like a painting. That's a great view to have from your office window. Okay, why do those clouds remind me of the opening of The Simpsons? How in the world do you get any work done? I don't know if I could steal my eyes away to work. Beautiful! You are blessed indeed. 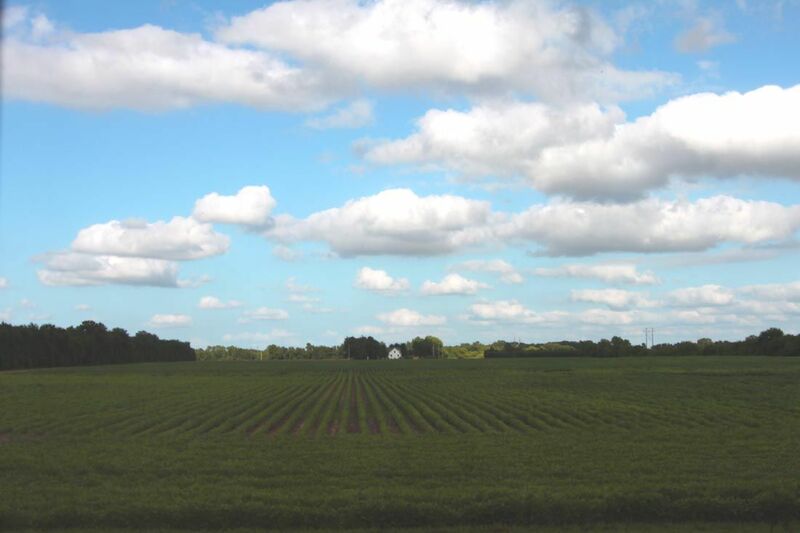 What a shot..It is beautiful..clouds/farmland..
Something very happy about farms..Kind of reminds me of my grandparents farm..only land was not flat. Those are very happy clouds:) I found myself with a lens pointed at the sky several times in the last week as well! Much better than the view from my office window. Although I have squirrels to occasionally entertain me. Hope you puter problems go away soon. hey, that looks like the view from MY window at work...oh wait, that's because we have the same view!! I agree, the photo looks like a painting....God painted it just for you! It does look like The Simpsons clouds!